Hi Terri. Yay Spring! I love your lovely teacup. And so glad your tea towels cleaned up. I just love vintage tea towels! Have a great week and thanks for hosting. I am there with you already, out on that balcony, smelling those linens, sipping tea, basking in that sunshine, I am there!!! Love everything I see in this post Terri, right at this minute you have set the tone for my dreams tonight...sweet! Hi Terri , thank you for the nice tea moment. For the moment it is spring in France... beautiful weather! Your teacup is so pretty and a lovely gift from Martha. I long to be able to hang some linens outside in the warmth of the sun. It's lovely to see some green grass there. We are having a nasty storm again today. Surely it's almost over for this year. We Islanders are really weary of the bad weather. Have a beautiful day, my friend. Pretty linens! And a lovely teacup. Terri, that is the perfect teacup for spring and a gift from Martha -- even better! Fun to see your "new" linens on the drying rack ... enjoy them! Thanks for hosting and Happy Tea Day. Thanks for the tips. I love vintage linens! I am always rummaging in the antique malls and flea markets for these! Yours look lovely on the porch! I'm so happy some of you are enjoying spring weather finally! Time to be at the balcony sipping tea from that adorable teacup and smelling the flowers in the garden. Thank you for hosting this lovely tea party. Oh, I love vintage linens too. I have some from my Mil. Thanks for the tip. I will come have tea with you in that tent! It was wonderful I rememebr it well! Thanks for hosting! Oh, and that is a gorgeous cup! Preciosa tu taza de té, fina y elegante como siempre y todo tu sitio lleno de un encanto especial. Te dejo un beso grande, siempre estoy contigo visitándote aunque no deje mensaje. Pd Tengo los comentarios cerrados pero igual sigo escribiendo. Es por salud. 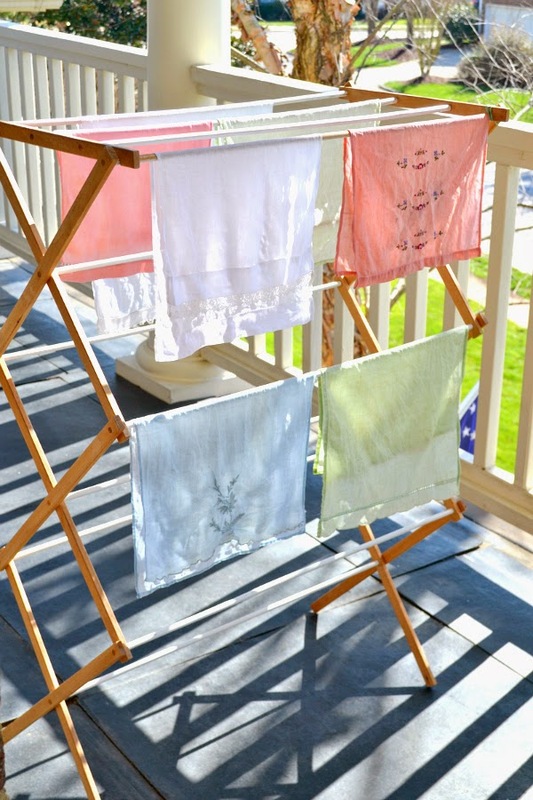 I have a wooden clothes dryer just like that and love hanging my linens out like that. Don't they smell fabulous when they dry outside?? Your teacup today is lovely. 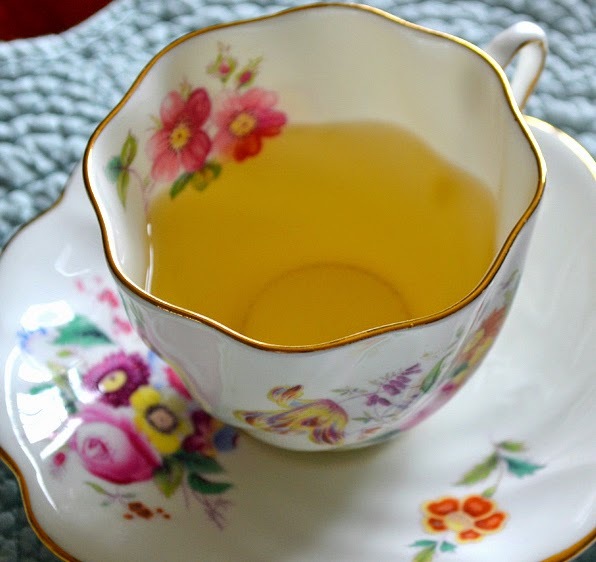 What a charming teacup, filled with calming chamomile, while beautiful, vintage linens sun in the breezy, spring air; lovely! Thanks for hosting and have a wonderfully inspiring week! What a sweet teacup Martha gifted you - it is so YOU! I am so glad you had good weather today - we did too. I had good intentions of doing a little tea time and shooting pics of it today, but the spirit moved me to get out in this perfect day because tomorrow is going to rain. I just had to shop a little and get some errands run. It's been entirely too long since I have joined up - hope to do soon now that spring is truly here. What a lovely tea cup! What a sweet gift and one I now you will treasure. I love to hang my linens outside, still have snow and cold here as of yesterday. Hoping for warmth soon! Hoping to have a garden tea with my young nieces and Jane Austen ladies group when the weather gives! Thanks for the kind visit!! 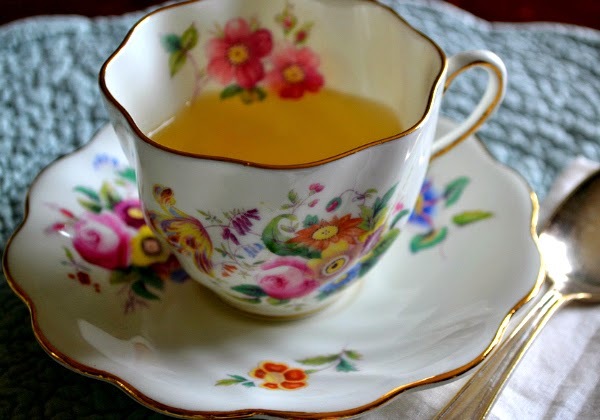 Another beautiful tea cup Terri. I do hope Bertha gets to be out lots this summer! I love the scallop of your teacup and yes the flowers are so Springy! Wish we had that warmth too! 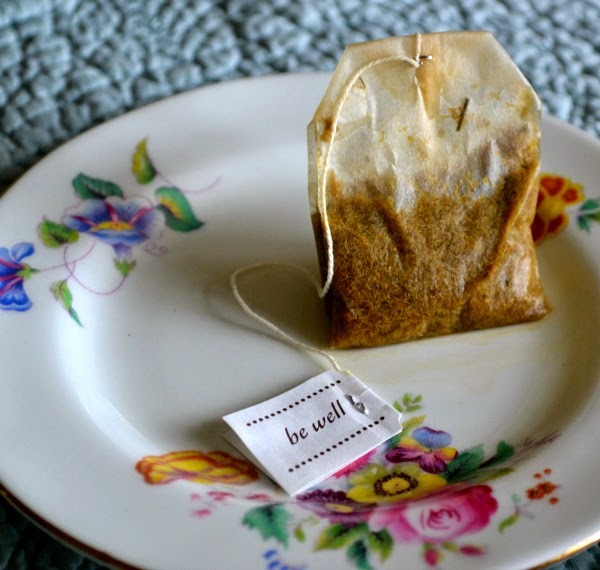 I have yet to try Chamomile tea...which are your favorites Terri? hugs and wishes for a wonderful day! Hi Terri, thank you for hosting. It feels good to join in your fabulous tea party again. That tea cup is so pretty, so charming and delicate looking. How sweet of Martha to give it to you. It's nice to be swap gifts with friends. Enjoy warmer weather and the beautiful colour of spring. A tea tent sounds lovely! Spring is still damp and very chilly here. My Spring dream is hoping to have the yard work caught up before Summer hits full blast! Have a great week and thanks for hosting! What a special moment to sip tea from such a beautiful tea cup, dear Terri,-and imagining sitting on your balcony, with new pottet flowers, maybe smelling sweetly,- overlooking your garden,would be a dream. Your linen handtowels looks lovely on the rag. even the soaking towels look at your photos so pretti. You really know how to arrange things for looking good. 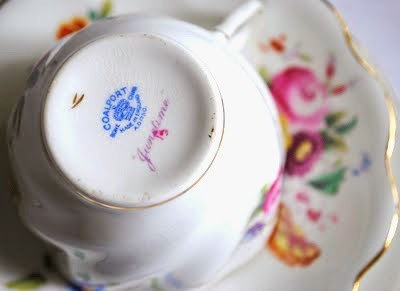 The Coalport tea cup is very nice. I love the swirl design as much as the pretty flowers. I am so curious what you will make this year with Bertha. So sad that you couldn't play so much with her last year. Hopefully this year will be better. Thank you for sharing this sweet thoughts and for hosting this sweet event. Super beautiful post Terri.always enchanting to see what magic you are creating..love your dyed linens..so lovely and elegant! Happy Tea! That is a lovely cup! So spring-y! Our weather has started to be warmer also, but a bit windy to sit outside and enjoy some tea. Hopefully soon! Having tea in a tent sounds like fun. Thanks for sharing your teacup and linen towels. 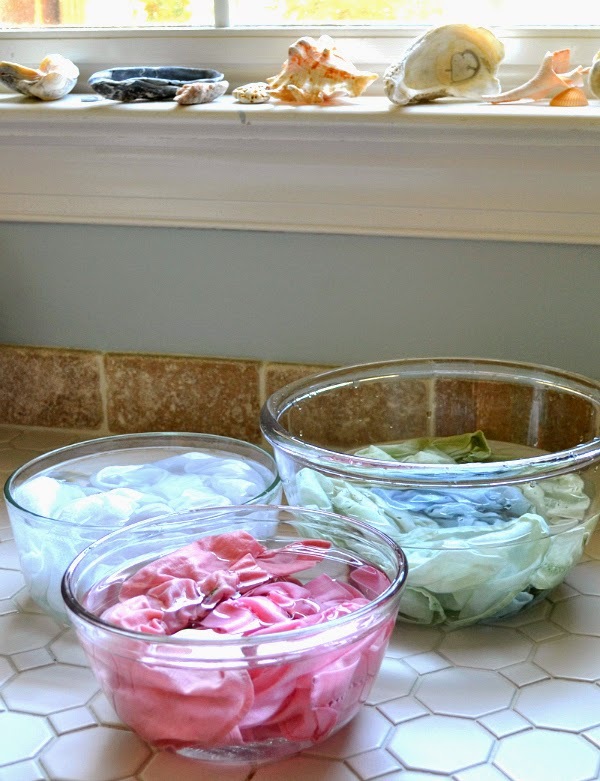 May I know whether you added detergent while soaking the linens? I have some linen handkerchiefs and some carry stains. I would like to know how many hours do you soak them? There is so much cheer in this post with all the beautiful flowers on your Spring themed cup and saucer. The sunshine on your face sitting on your balcony watching your dyed hand towels drying must surely bring you some peaceful feeling. It will be no time at all before we see Bertha appearing on your lawn once again! Sending some warm hugs and rays of loving sunshine. Such a beautiful place to sit surrounded by lovelies! Hope you are well! Hey Terri! That's a cute cup. Very Springy indeed! I saw a stack of flowered cups at the store yesterday and thought immediately of you. Enjoy your balcony. And I can't wait to see more pictures of Bertha! I hope youre having a wonderful weekend! Lovely teacups dear Terri, but then you have the most Darling collection! I love vintage towels and I just won one on a giveaway, can't wait to receive it, along with a gorgeous teacup! Thank you for hosting sweet lady. Have a nice week. I so love the look of vintage linens hanging outside. Happy Spring!